"Once upon a time, brave men and brave women in fast cars raced on the serpentine roads of the mountains of the Madonie in Sicily. They were brave men and brave women indeed because on one side of the narrow and often barrierless road a wayward car might fall for some considerable distance before encountering the valleys of the Madonie, while on the other a fender might promptly meet up with the mountainside. But at the end of that road there would be, for the winner, the solid gold Targa (plate) commissioned by Vincenzo Florio, and the glory that came with it". 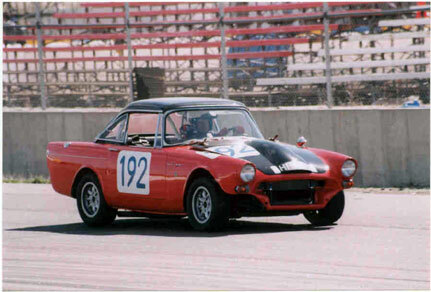 In any event, this car, driven by Peter Harper and the Revd Rupert Jones, ran the 49th Targa Floria, Sicily, race in 1965 under the sponsorship of British Vitafoam (your soft seat cushions). The car, as can be seen, had unusual coach work, and it did not stop there. A modified "works" rally car, The car was built by the Rootes Racing Department, (with a "4.7 L." 'Cobra' 4 barrel Holley according to Revd Jones, in his Feb. 81 "Collector's Car" article), had cooling ducts wherever there was a place for one While it has been reported that the cooling air flow was directed through ducting to cool the rear brakes, then left though the "boot", the actual arrangement is the rear brakes vented through flexible tubes mounted under the trunk, and not through the trunk, looking much like dual exhaust pipes. Most other sources (official (?) results) " Le Mans Register" list the block as a 289 block, and the engine was reportedly a Shelby prepared 289. 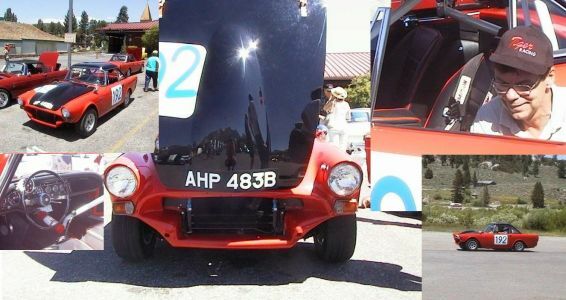 This car was built by the Fitted with wider wheel rims, it finished 2nd!! Well, that was pretty amazing, as the winner in that "prototype" class was a Ferrari 275P2, and the Tiger was more than 15 per cent behind it, relegating it to "unclassified'. As we are all used to protests NOT coming out in our favor, this time, after weeks of consideration, the Tiger was re-instated in the class, and earned a class 2nd. Dave's restoration is true to the look in 1965, including the hard top. Dave McDermott, of Denver CO, was looking for another "project" in 1996, and heard about the Targa Tiger. What he heard sounded interesting. According to Dave, he bought the car sight unseen. 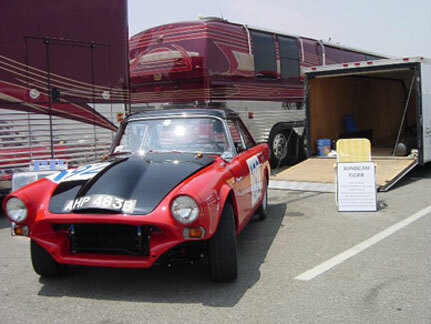 The purchase and shipment of an old race car to the U.S. required navigational skills amongst the bureaucratic nightmare of export/import regulations, transportation, customs, port to destination shippings, and INSURANCE. All of which had little to do with a man with automotive dreams. Then the agonies all classic owners pass through - "The Nine Levels of Hell". Original Factory Rally Trim, or Race Trim? Easy, man. The Targa Florio was a BIG prestigious International Event, and perhaps the most prestigious of it's career. To be period correct, you just open the literature and select the era/configuration -right? HAH! A lot of careful research here. Dave recalls that the car had bee sitting for over 20 years, and saw it's share of deterioration in that period. Then there was the "Box of Goodies" that came with the car. Some of these loose parts might actually have been from this car, but which? Research in England with Des O'Dell, Competition Manager for Rootes, and with the car in Sicily, was able to provide old factory papers and documentation, according to Dave, and Dave copied some original Rootes photos. Even a Targa Florio film - made by Castrol - was obtained. The engine installed was a 289 CID Ford, built to Shelby specs, and a 3.55:1 rear end. AHP483B now gleams as fresh as when new - maybe better. A very complete article was published for Dec., 2002, by "Grass Rootes Motorsports" magazine, authored by John Webber. July 9, 2003: The new engine goes in today. It is a true vintage race motor with all the goodies. I had a lot of technical help on it from Dan Walters and Walt Hane. Hopefully it will be on the dyno on Monday. August 3, 2003: The new engine was dynoed last week with 409 peak engine HP converted to sea level. I then track tested the car last Thursday and everything seemed OK-205F water temp on 95 degree day oil temp at 105C. The car was also accepted for the Re Historics so I will be leaving on Wednesday.